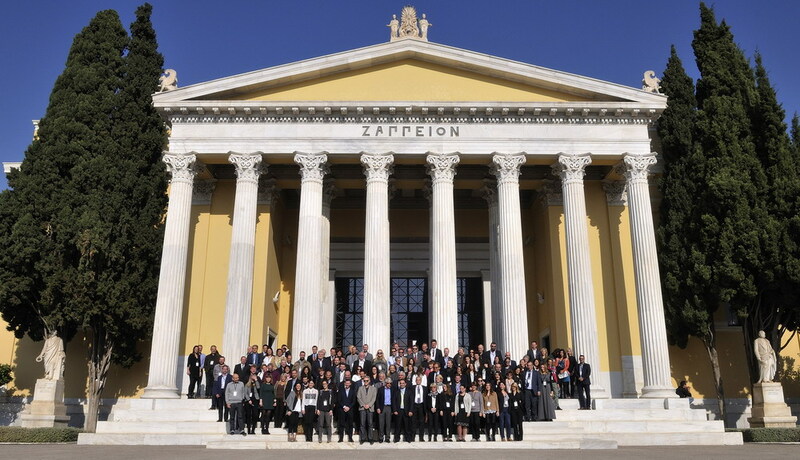 November 2016, Athens, Greece – The GSTC European Regional Meeting in Athens, Greece, took place on 23-24 November 2016, with 200 participants, including many GSTC members and GSTC Board members, coming from 16 countries. The event brought a rare opportunity of face-to-face discussions on the subjects of the event sessions: Sustainability Standards and Programs for European Tourism; European Best Practices for Sustainable Management of Destinations and Enterprises; Marketing Sustainable Tourism in European Destination; The Value of a Global Sustainability Brand for Greece Tourism; and Applying Standards and Certifications to Destinations and Enterprises. The conference was greeted by GSTC Chair Luigi Cabrini, followed by a keynote speech by the Bank of Greece Chief Economist Dimitris Malliaropulos on climate change challenges and the role of sustainable tourism in Greece’s new growth model. Destinations Certification in Greece was then explained by the Mayor of Milos Island and President of the Tourism Board of Central Union of Greek Municipalities Gerasimos Damoulakis. Participants also heard from key sustainable tourism professionals including: Albert Salman, President – Green Destinations Foundation; Andrés Fellenberg van der Molen, Technical Director – GSTC; George Drakopoulos, President & CEO – tourism generis; Dr. Ioannis Pappas, Co-founder and CEO – Green Evolution SA; Lonneke de Kort, CEO – Bookdifferent.com; Martina von Münchhausen, Global Marine and Coastal Tourism – WWF; Mary Mulvey, CEO – Ecotourism Ireland; Naut Kusters, Manager – Travelife for Tour Operators; Olaf Schlieper, Innovation Manager – German National Tourist Board; Panos Thomakos, Editor – Tornos News International; Rika Jean-François, CSR Commissioner – ITB Berlin; Sören Stöber, Commercial Director – Travelife for Hotels; Tom Johnston, Senior Sustainability Manager – TUI Group; Dr. Xavier Font, Professor – University of Surrey; and many more. 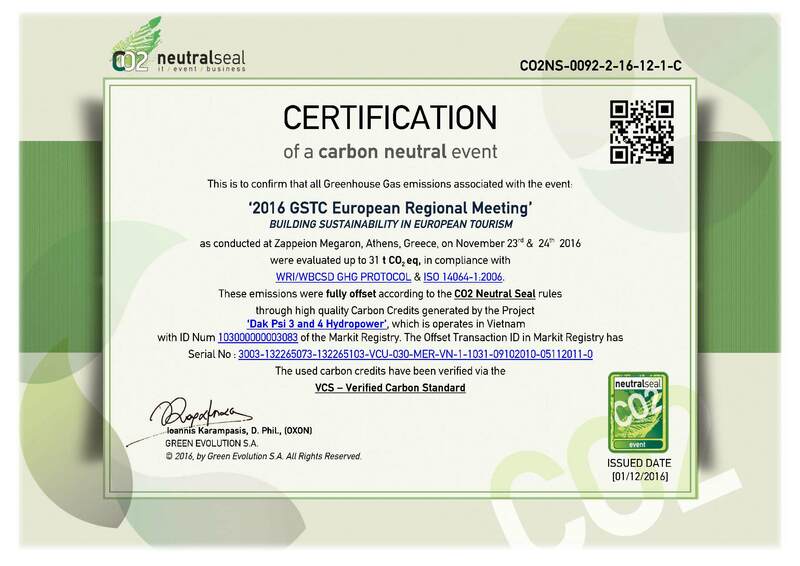 The event’s carbon footprint was offset by the carbon offsetting sponsor Green Evolution SA, to become a ‘carbon neutral event’ by the scheme CO2 NEUTRAL SEAL. During the event usage of plastic was reduced to a minimum degree, badges were reused, and the remains of the food from lunch were donated to the organization ‘We Can’ (ΜΠΟΡΟΥΜΕ). Presentations from the conference can be accessed here, and will be available online until September 2017. Photos from the event can be found on GSTC Facebook page: Day 1, Day 2. The 2016 GSTC European Regional Meeting was sponsored by Kafkas S.A., Green Evolution S.A., TUI Group, and Control Union, under the auspices of Bank of Greece, Greek Ministry of Economy, Development & Tourism, Central Union of Greek Municipalities, and Hellenic Association of Travel Agents. 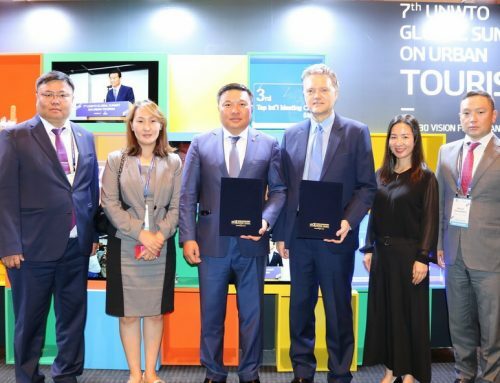 Key partners were Tornos News, Greenmind Advertising, and Conferience. Look for announcements of the location and dates of GSTC Events in 2017. The Global Sustainable Tourism Council (GSTC) is a global initiative dedicated to promoting sustainable tourism efforts around the world. The GSTC works to expand understanding of and access to sustainable tourism practices; helps identify and generate markets for sustainable tourism; and educates about and advocates for a set of universal principles, as defined by the Global Sustainable Tourism Criteria. The Criteria, a set of voluntary principles that provide a framework for the sustainability of tourism businesses across the globe, is the cornerstone of our initiative.For more information, visit www.gstcouncil.org.